Tell your story with maximum impact using Adobe Premiere Pro software, the start-to-finish solution for efficient video production that now includes Adobe OnLocation and Adobe Encore. Save time from on-set capture using Adobe OnLocation through to output, expand your creative options via integration with Adobe After Effects Professional and the Adobe Photoshop program, and deliver your original content to Blu-ray Disc, DVD, the web and mobile devices. • End-to-end metadata workflow - Easily add metadata to clips both on set with Adobe OnLocation software and while editing using Adobe Premiere Pro, for greater project intelligence. Use speech recognition technology to create text-based metadata to help you organize your assets more efficiently. Pass the metadata through export for web publishing, enabling searchable video and helping to unlock new revenue streams. • Batch encoding in the background - Save time with Adobe Media Encoder, a separate included software application that automates the process of creating multiple encoded versions of your source files and sequences. Manage priorities and control advanced settings for individual files. • Redesigned Adobe OnLocation CS4 - Get critical monitoring information while you record directly to disk with Adobe OnLocation CS4, now cross-platform with a new Adobe-standard interface. Save time and take the tedium out of logging with shot lists and metadata-based project intelligence. • Tapeless camera support - Edit video natively in the latest tapeless formats, including RED, AVCHD, P2, XDCAM EX, and XDCAM HD, without transcoding or rewrapping. Browse your drives and removable media from inside Adobe Premiere Pro to find, log, and import footage. • Industry-leading Blu-ray Disc authoring - Maintain the pristine quality of your HD video all the way to distribution. Create high-definition Blu-ray discs with Encore CS4, working with the same interface used to create standard-definition DVDs and incorporating advanced Blu-ray features like pop-up menus and subtitles and dual-layer burning. • Faster, customizable SWF output - Create SWF file versions of your DVD and Blu-ray projects for the web, complete with DVD interactivity, menus, URL links, and customizable HTML templates, without opening another application. Export for streaming or progressive download, and reduce encode time by using optimized encode settings in Adobe Media Encoder. • Dynamic workflow with other Adobe tools - Achieve a high level of productivity from production to delivery with the tightly integrated toolset in Adobe Premiere Pro. Eliminate intermediate rendering when moving sequences into Adobe Encore software, and take advantage of new support for Adobe Photoshop files with video and blend modes. • Final Cut Pro project import - Take advantage of the benefits of the Adobe workflow to finish your Final Cut Pro project, moving content to Adobe After Effects software, using Speech Search to create searchable video, and exporting through Encore to Blu-ray, DVD, and the web. Use Final Cut Pro XML interchange to transfer projects directly from Final Cut Pro to Adobe Premiere Pro without conversion or rerendering, preserving commonly used effects and transitions. • Streamlined, highly intuitive user interface: See more of your video and less clutter thanks to a highly intuitive, customizable interface. New monitor panels include a customizable button bar; the new Project panel focuses squarely on assets and allows clips to be skimmed, scrubbed, and marked up for editing. A new audio track design, improved meters, and a revamped Mixer panel make working with sound easier than ever. • Enhanced Mercury Playback Engine: Work dramatically faster thanks to sweeping performance, stability enhancements, and support for NVIDIA Maximus dual-GPU configurations and certain MacBook Pro OpenCL-based AMD GPUs.† Adobe Mercury Transmit enhances integration with third-party I/O devices. • Fluid, high-performance editing workflow: Take advantage of the most requested editing enhancements, including over 50 new features to help editors switching NLEs move more comfortably to Adobe Premiere Pro. • Dynamic timeline trimming: Finesse your editing with precision using all-new advanced trimming tools. Trim clips your way — directly in the timeline via keyboard entry or dynamically in the Program Monitor using JKL shortcuts. • Warp Stabilizer effect: Easily stabilize a bumpy camera move or lock a shot automatically with the same powerful technology as in Adobe After Effects® software. The new GPU-accelerated Warp Stabilizer removes jitter and rolling shutter artifacts and other motion-related irregularities. • Expanded multicam editing: Quickly and easily edit multicam footage from as many cameras as you have on the shoot. Sync via timecode, switch between tracks in real time, and adjust color across multiple shots. • More intuitive Three-Way Color Corrector: Better manage the color in your projects with the more intuitive Three-Way Color Corrector for precise primary and secondary color correction. Instantly improve video image quality with Adobe Photoshop® style auto-correct functions. • New adjustment layers: Apply effects across multiple clips. Now you can create adjustment layers, similar to those in Photoshop and After Effects, to apply effects to clips on tracks below them. Easily create masks to adjust a selected area of a shot. • Improved, customizable monitor panels: Work the way you want and edit more fluidly. A less cluttered, customizable interface lets you focus on your media by letting you choose which buttons to show or hide in the monitor panels. • Even faster Project panel workflows: View, sort, and arrange media easier than ever with the redesigned Project panel. Edit faster with the ability to scrub and skim clips, set in and out points, and resize clip thumbnails. • Native DSLR camera support: Work natively with the footage shot with the latest video cameras, including ARRI Alexa, Canon Cinema EOS C300, RED EPIC, and RED Scarlet-X cameras. Native support lets you start editing immediately, without transcoding or rewrapping the footage. • Enhanced, flexible audio tracks: Freely combine and pan mono and stereo clips. For more advanced audio workflows, new Multichannel master and Adaptive track types enable total audio routing flexibility and easy export to multichannel file types. • Adobe Prelude CS6 integration: Use Adobe Prelude to efficiently log footage, add comments and markers, and create rough cuts that can be brought into Adobe Premiere Pro. Comments and markers are associated with the media, making it easy to organize. • Adobe SpeedGrade CS6 integration: Easily export your Adobe Premiere Pro sequences into SpeedGrade CS6 for a complete finishing solution. Easily handle grading tasks like matching shots and creating consistent nuanced color to visually enhance your projects. • Rolling Shutter Repair effect: Easily repair media with rolling shutter artifacts such as wobble and skew. Based on technology in the Warp Stabilizer, this powerful effect can be applied without stabilization and offers enhanced controls. • New Preset Browser: Access commonly used settings immediately using the new Preset Browser in Adobe Media Encoder CS6. Organize presets by category, set favorites, and customize your most frequently used encoding presets. 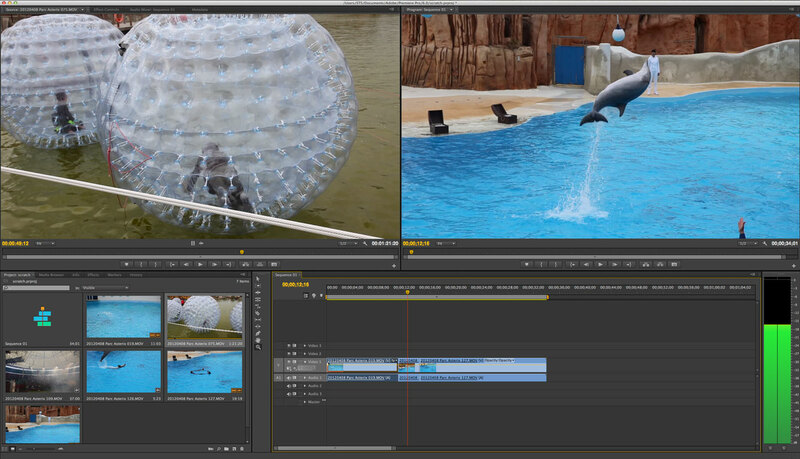 • Performance and stability improvements: Encode video faster when outputting a single source to multiple outputs with Adobe Media Encoder CS6. Get a significant performance boost when using watch folders on a network. • New RED EPIC and RED Scarlet-X support: Take advantage of new support for RED EPIC 5K and RED Scarlet-X footage that lets you import it directly into Adobe Media Encoder CS6 for transcoding to HD and SD formats. • More popular device and format presets: Save time and encode content more easily by using Adobe Media Encoder presets that help ensure your video looks great on widely used output formats and devices, including mobile devices and HDTV. • New 64-bit Adobe Encore CS6: Speed up your authoring workflow and get rock-solid performance and stability with Adobe Encore CS6, now natively 64 bit. Open and save projects faster, and get dramatic performance working on demanding projects. • Faster MPEG import: Bring MPEG assets into Encore CS6 even faster as multiple import processes happen simultaneously in the background. • Pixel aspect ratio correction in previews: View the correct pixel aspect ratio when previewing DVD simulations, thanks to new pixel aspect ratio correction in Encore CS6. • Enhanced DVD and Blu-Ray Disc authoring: Get even more functionality when authoring DVDs and Blu-ray discs. New 64-bit Encore CS6 adds support for 8-bit color for highlight buttons and menu color quality enhancements and lifts the 99-slide restriction for Blu-ray slide shows. • Enhanced web DVD authoring: Create powerful web DVD experiences that replicate all the functionality of their Blu-ray Disc counterparts, thanks to new web DVD support for pop-up menus, multipage menus, and looping menu playback.